Republican efforts to repeal and replace Obamacare may have collapsed, but as Northern Trust economists Carl R. Tannenbaum and Ankit Mital wrote in a note published Friday, there’s a broader healthcare debate that still needs to happen. 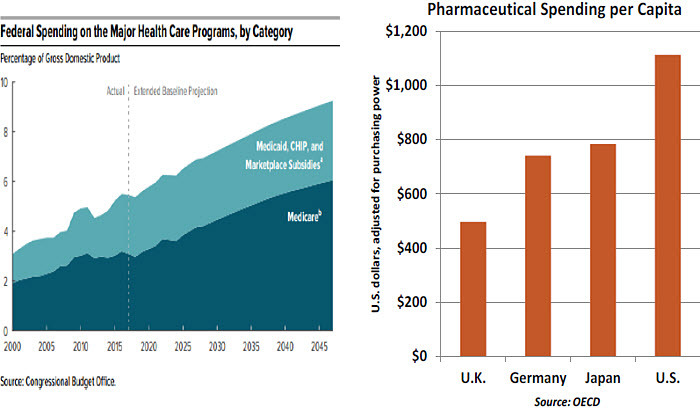 As the Northern Trust charts below suggest, drug prices must be part of that discussion, given that pharmaceuticals account for about 10 percent of total U.S healthcare spending, or some $325 billion a year. That steep annual bill is also expected to rise 6.3 percent a year over the next decade, the economists say — a pace far faster than overall inflation or income growth. Allowing the re-importation of drugs from countries like Canada, where the medications cost less. The question is whether or when we’ll move on from debating Obamacare to some of these other structural issues.